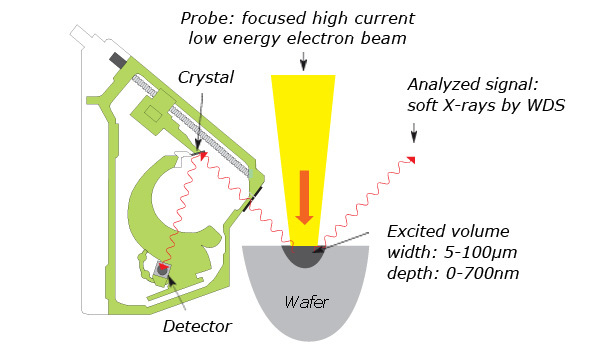 Low energy Electron induced X-ray Emission Spectrometry (LEXES) consists in irradiating a solid sample by a low energy electron beam and analyzing the soft X-rays emitted by the target. Because the X-rays are characteristic of the emitting elements, selective elemental analysis is achieved. The analyzed depth can be varied between 1 to 700 nanometers, depending on parameters such as element, matrix and primary electron energy. The precise modeling of primary electron/matter interaction and of soft X-ray absorption allows precise elemental quantitation of the sampled depth over a wide range of concentrations (from 100 at% down to tens ppm). The matrix effects are small and well modeled. Hence, standard samples are readily available (pure materials or stochiometric compounds). One major application of the LEXES technique is the fast quantitative dose measurement of ultra-shallow implants over a wide dose range, with or without annealing. In addition to dose measurement, depth distribution information is also extracted from the analysis of the signal at different primary energies (different sampled depths). LEXES is an extremely sensitive technique thus perfectly matching the needs of LE and ULE (Ultra Low Energy) implantation technology. The beam size is fully compatible with patterned wafers. In addition to implant metrology, chemical composition in all oxide and/or metal stacks can be monitored (from a few Å up to several hundreds nm). Major critical parameter such as lanthanum and aluminium doses in HKMG and quantitation of nitrogen and oxygen in oxynitrides are addressed. In epitaxial layers such as SiGe, the SiGe layer composition and thickness can be measured simultaneously with the boron or phosphorous dopant. The increasing needs for accurate dose measurement of ULE implants and the acknowledged expertise of CAMECA in both SIMS and EPMA led to the development of a unique, innovative metrology tool based on the LEXES technique, the EX-300 Shallow Probe.